Humanity's physical design flaws have long been apparent - we have a blind spot in our vision, for instance, and insufficient room for wisdom teeth - but do the imperfections extend to the genetic level? In his new book, Inside the Human Genome, John Avise examines why - from the perspectives of biochemistry and molecular genetics - flaws exist in the biological world. 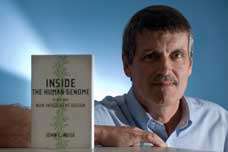 He explores the many deficiencies of human DNA while recapping recent findings about the human genome. Distinguished Professor of ecology & evolutionary biology at UC Irvine, Avise also makes the case that overwhelming scientific evidence of genomic defects provides a compelling counterargument to intelligent design. Here, Avise discusses human imperfection, the importance of understanding our flaws, and why he believes theologians should embrace evolutionary science. Q: How flawed is the human body? A: Many of the defects, such as those causing difficult childbirths, appendicitis or bad backs, have been painfully obvious for millennia. What was less apparent until very recently is the extent to which biological flaws might also be present deep within our DNA. Technological advances in the last decade have made it possible to examine our genetic material in excruciating detail. We now know that the human genome is riddled with molecular defects of many sorts. Q: Why is it important to identify and understand these biological flaws? A: That's what medicine is all about, really - trying to heal our bodies when things go wrong. It's interesting to contemplate what the practice of medicine might look like a century or more from now. It's quite possible that science will find ways to cure patients or maybe even rid our species of serious genetic disorders through molecular-level microsurgery on some of our faulty genes. Q: How does scientific evidence of human imperfection contradict intelligent design? A: Proponents of intelligent design understandably focus on the many beauties of life, claiming that smooth-working biological traits prove direct creation by a supernatural deity. However, natural selection in conjunction with genetic processes can also produce complex biological systems that usually function well. So both natural selection and intelligent design are consistent with the appearance of biological craftsmanship. Serious biological imperfections, on the other hand, can only logically be expected of nonsentient evolutionary processes that are inherently sloppy and error-prone. They're more troublesome to rationalize as overt mistakes by a fallible God. Q: Why do you think theologians should welcome evolutionary discoveries? A: Theodicy is the age-old conundrum of how to reconcile a just God with a world containing evils and flaws. With respect to biological imperfections, evolution can emancipate religion from the shackles of theodicy. No longer need we feel tempted to blaspheme an omnipotent deity by making him directly responsible for human frailties and physical shortcomings, including those we now know to be commonplace at the molecular and biochemical levels. No longer need we be apologists for God in regard to the details of biology. Instead, we can put the blame for biological flaws squarely on the shoulders of evolutionary processes. In this way, evolutionary science can help return religion to its rightful realm - not as a secular interpreter of the biological minutiae of our physical existence, but rather as a respectable counselor on grander philosophical issues that have always been of ultimate concern to theologians. A: First, I hope they'll learn a great deal about the structure and operation of the incredible human genome. But more generally, I hope they'll come to see that the evolutionary and genetic sciences can and should be viewed as helpful philosophical partners - rather than inherent nemeses - of theology and religion. Q: You have researched ecology and evolution for more than 40 years. What interests you most about these fields? A: My academic "grandfather," Theodosius Dobzhansky, once wrote that "nothing in biology makes sense except in the light of evolution," and it's taking me a lifetime to fully appreciate the wisdom of that truism. Evolution, genetics and ecology are central to so many areas - not only in biology but also in countless human affairs ranging from religion to medicine to environmental issues. I can't imagine a more fascinating and stimulating set of fields in which to be engaged.